—On Sept. 13, 1814, Francis Scott Key visited the British fleet in Chesapeake Bay to secure the release of Dr. William Beanes, who had been captured after the burning of Washington, DC. The release was secured, but Key was detained on ship overnight during the shelling of Fort McHenry, one of the forts defending Baltimore. In the morning, he was so delighted to see the American flag still flying over the fort that he began a poem to commemorate the occasion. First published under the title “Defense of Fort M'Henry,” the poem soon attained wide popularity as sung to the tune “To Anacreon in Heaven.” The origin of this tune is obscure, but it may have been written by John Stafford Smith, a British composer born in 1750. “The Star-Spangled Banner” was officially made the national anthem by Congress in 1931, although it already had been adopted as such by the army and the navy. Here's the U.S. national anthem but these days, people only sing its first paragraph. O say, can you see, by the dawn's early light,What so proudly we hail'd at the twilight's last gleaming?Whose broad stripes and bright stars, thro' the perilous fight,O'er the ramparts we watch'd, were so gallantly streaming?And the rockets' red glare, the bombs bursting in air,Gave proof thro' the night that our flag was still there.O say, does that star-spangled banner yet waveO'er the land of the free and the home of the brave? On the shore dimly seen thro' the mists of the deep,Where the foe's haughty host in dread silence reposes,What is that which the breeze, o'er the towering steep,As it fitfully blows, half conceals, half discloses?Now it catches the gleam of the morning's first beam,In full glory reflected, now shines on the stream:'Tis the star-spangled banner: O, long may it waveO'er the land of the free and the home of the brave! And where is that band who so vauntingly sworeThat the havoc of war and the battle's confusion,A home and a country should leave us no more?Their blood has wash'd out their foul footsteps' pollution.No refuge could save the hireling and slaveFrom the terror of flight or the gloom of the grave:And the star-spangled banner in triumph doth waveO'er the land of the free and the home of the brave. 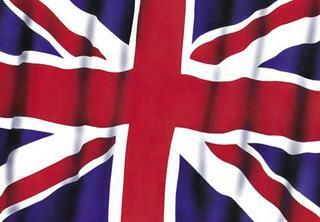 This is the British flag as you all know.The Union Flag, or Union Jack, is the national flag of the United Kingdom. It is so called because it combines the emblems of the three countries united under one Sovereign - the kingdoms of England and Wales, of Scotland and of Ireland (although since 1921 only Northern Ireland has been part of the United Kingdom).The flag consists of three heraldic crosses.The cross of St George, patron saint of England since the 1270's, is a red cross on a white ground. After James I succeeded to the throne, it was combined with the cross of St. Andrew in 1606. The cross saltire of St Andrew, patron saint of Scotland, is a diagonal white cross on a blue ground.The cross saltire of St Patrick, patron saint of Ireland, is a diagonal red cross on a white ground. This was combined with the previous Union Flag of St George and St Andrew, after the Act of Union of Ireland with England (and Wales) and Scotland on 1 January 1801, to create the Union Flag that has been flown ever since. Try and create an English blog of yours. Post its address in the comments.You might get a good grade for it!